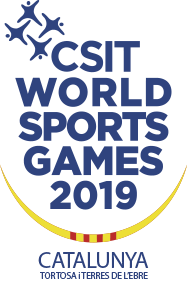 Athletes who participated during the last 2 years as representing their country in the Olympic Games or a beach volley o senfcompetition organized by the FIVB or a Continental Confederation ( not taking into account the age group competitions for the categories under 20 years or younger) cannot participate in the CSIT competitions. In the case of a “not clear status” the participating federation has to clarify the status by sending all relevant information’s to the TC Volleyball at least 2 weeks before the single Championship or the World Sport Games It is to be decided by the TC chairman and secretary indoor Volleyball if the eligibility criteria is valid or not before sending the player(s) to the CSIT Championships or World Sports Games. Unions/parties can bring unlimited number of teams per gender , in case of registration of more than one team , they need to have a delegation leader. Participants: composition of a team : 3 players on the court , plus one possible substitute . Coach: the participation of a coach is possible , this coach has to be on the score sheet . Substitutions: maximum 4 substitutions during a set , the substitution of the players are free . Block: a blocking contact is not counted as a team hit ; the blocking team will have three hits after the blocking contact . Format of the matchs : all matchs are the best 2 out of three 3 sets . 2 players ( 1 man and 1 woman ) , 1 possible coach . 1) Composition of the team : 2 players: 1 female player and 1 male player ; no substitutes. 2 ) Coaching : the participation of a coach is possible during the matchs ; this coach has to be on the score sheet . 3 ) Height of the net : 2m35 . Two phases : groups and then single elimination bracket . Format of the matchs : one single set or the best 2 out of three 3 sets ; semi finals and finals are the best 2 out of 3 sets .